Are you ready to party yourself into shape? That’s exactly what the Zumba programme is all about. It’s an exhilarating, effective, easy to follow, Latin inspired, calorie burning, dance fitness party that’s moving millions of people towards joy and health! 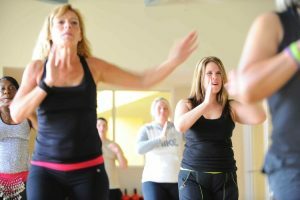 Sessions run at Manley Village Hall on Thursdays at 6.30—7.25pm and on Sundays at 9.00—9.55am.